FamilyLife Today® is conversational in nature and provides practical, biblical tools to address the issues affecting your family. You'll receive motivation, encouragement, and help. Dave and Ann Wilson are hosts of FamilyLife Today© with cohost Bob Lepine. Cofounders of Kensington Church—a national, multicampus church that hosts more than 14,000 visitors every weekend—the Wilsons are the creative force behind DVD teaching series Rock Your Marriage and The Survival Guide To Parenting, as well as authors of Vertical Marriage. 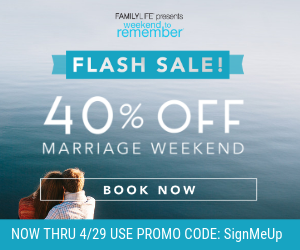 They have been featured speakers at FamilyLife’s Weekend to Remember® since 1993, and they have also hosted their own marriage conferences across the country. To find out more about the Wilsons, visit FamilyLifeToday.com. Bob Lepine is senior vice president of FamilyLife and cohost of FamilyLife Today©, FamilyLife’s nationally syndicated radio program. A veteran of Christian radio, Bob has a degree in communications from the University of Tulsa. Prior to joining FamilyLife in 1992, Bob worked for local radio stations in Tulsa, Phoenix, Sacramento, and San Antonio. He is the author of The Christian Husband and the on-air voice for “Truth for Life” with Alistair Begg. Bob also serves on the Board of Directors for National Religious Broadcasters. Bob and his wife, Mary Ann, live in Little Rock, Arkansas, where he also serves as an elder and teaching pastor at Redeemer Community Church.